Hello and welcome Dare 2B Artzy fans! I’m excited to be back today sharing my latest card here on Dare 2B Artzy. For this project I used the Big Bloom stamp set. I really love this flower and it’s perfect for the technique I’m going to showcase with today’s card. The technique for this card is called white washing. 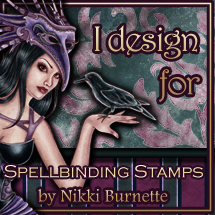 It gives a subtle painted or water color look for stamps on Kraft cardstock. This technique is excellent for most any type of flower stamp. I started off my card by cutting a piece of Kraft cardstock. I used a cute scalloped die to cut mine. Next I inked my stamp with some Versamark embossing ink. I stamped it onto the Kraft paper and then used some ultra-fine white embossing powder and heat set it. To create the white washing I used an aqua brush and some white pigment ink. You can also use a chalk based ink for creating a white washed effect. I let my brush get a bit wet and then rolled it across the white craft ink pad and then painted my stamped image white. The embossed edges of the image keep the ink paint from bleeding outside the lines. You can control the opacity of the image by adding more or less water with the white ink. The trick is to not let your paper get too wet. In order to keep the paper from getting too wet, it’s best to paint the white on in layers and let it dry in between painting on more white. Once your satisfied with the level of white washing, let it dry again and then you can start painting on your colors. I used the same technique for the colors, using a wet brush and then dipping in a bit of dye ink color and painting on color over the white washing layer (pigment inks will also work for adding a layer of color). I added color from the center of the flower outwards towards the ends of the petals. Once I’d finished the flower, I added a different color to the leaves. How much color to add is a personal choice. My end result is a really soft water color effect on the white background. Once I was happy with the level of color on the Big Bloom, I let it dry completely. I embossed the sentiment Bloom where you are planted with the white ultra-fine embossing powder. I added a pearl brad to the center of my flower and created a couple of die cut flags and added another floral antique brad to them. I layered the Kraft cardstock over another piece of teal colored cardstock using some dimensional foam strips. Both layers were added to my final white card base. Hope you’ve enjoyed today’s card. Please be sure to check out all of the other flower stamps in the Dare 2B Artzy shop here as there are many to choose from and they would work beautifully with a white wash technique such as this. Hope you have a wonderfully crafty day!